“We are well into 2014 with the 2015 MDG deadline fast approaching. Inventions and innovations, scientific discoveries, incredible advances in technology – even with all this, there are still more than 2 billion people infected with TB in the world and 9 million new TB cases every year. 1.3 million die every year. Sadly, 3 million are missed by health systems and they do not have access to proper diagnosis, treatment, follow up and the care that they deserve and need. We are outraged that we still have people dying from TB, a disease that is curable with a six month treatment regimen which costs less than USD 40 for all six months. We are outraged that we do not speak in Africa of zero TB deaths. 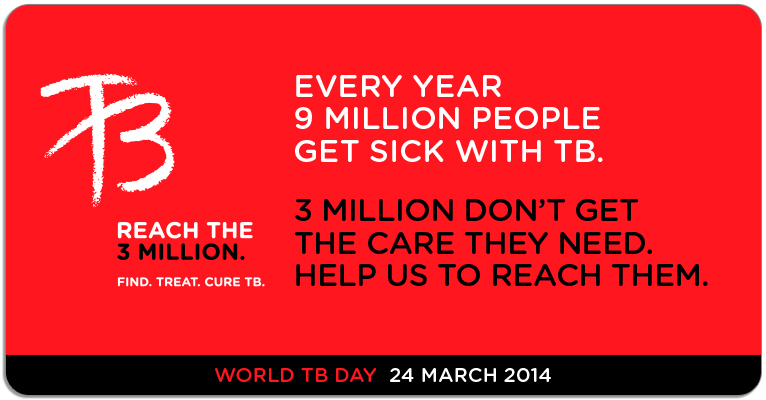 We aim to defeat TB – but to defeat it, we need to acknowledge it and understand it. On this World TB Day I am writing this statement from Johannesburg, South Africa. I believe that it is here that governments, ministers, the private sector, partners and communities will get together to try and understand and address challenges for TB and mining. To understand why we still have 3 million cases missed every year and to understand where and why these cases occur. To understand those most vulnerable to falling ill with TB or having poor outcomes. These include, amongst others, very poor and/or malnourished or undernourished people, people living with HIV/AIDS, children and women, migrants, prisoners, refugees and internally displaced persons, miners, the elderly, ethnic minorities, indigenous populations, substance users and homeless persons. To understand that there are many more children with TB in the world than we expected, as highlighted by the Lancet today. To understand that every country has cases that are missed but South-Asia and Africa account for nearly two-thirds of the burden of missed cases. To understand that incredible progress has been made. Nearly 22 million lives have been saved since 1995. There has been a 45% decrease in TB deaths since 1990. However, even with that progress, more than 1.3 million people died of TB in 2012, and 8.6 million people fell ill with TB. We have come far, yet not far enough. To understand that we can make history and achieve a lot with the current tools – investing strategically and smartly – but to understand that we will never eliminate TB unless we have new diagnostics, shorter and efficient regimens and new vaccines. To understand that to have new tools, we need significant investments now, if we want to make a difference in our lifetime. There is a lot to understand – by all of us – starting with the governments of countries that need to comprehend that development and progress will not happen without health. And that people being killed in 2014 by diseases which are more than 2000 years old, is a shame for us all. But more than anything, I think we need to understand to care. To care a bit more for those suffering and those in need of our help, to do THAT little bit more to help them and make a difference.